Al-Arafah Islami Bank Job Circular 2018. Al-Arafah Islami Bank Limited will recruit for various post. Online Application Deadline See the Job Circular for details. Al-Arafah Islami Bank Job Circular 2018. Al-Arafah Islami Bank Limited (AIBL) will recruit for the post of Data Modeller & Database Designer, Liquidity Analyst, Balance Sheet Analyst, Business Analyst (Finance), Sr. Business Analyst (Regulatory Analyst) and Sr. Report Developer. AIBL New Job Circular 2018 for the post of Data Modeller & Database Designer, Liquidity Analyst, Balance Sheet Analyst, Business Analyst (Finance), Sr. Business Analyst (Regulatory Analyst) and Sr. Report Developer circular released on See the Job Circular for details. Al-Arafah Islami Bank Limited is one of the leading prominent Bank in the Banking sector of Bangladesh. AIBL will recruit for various posts. 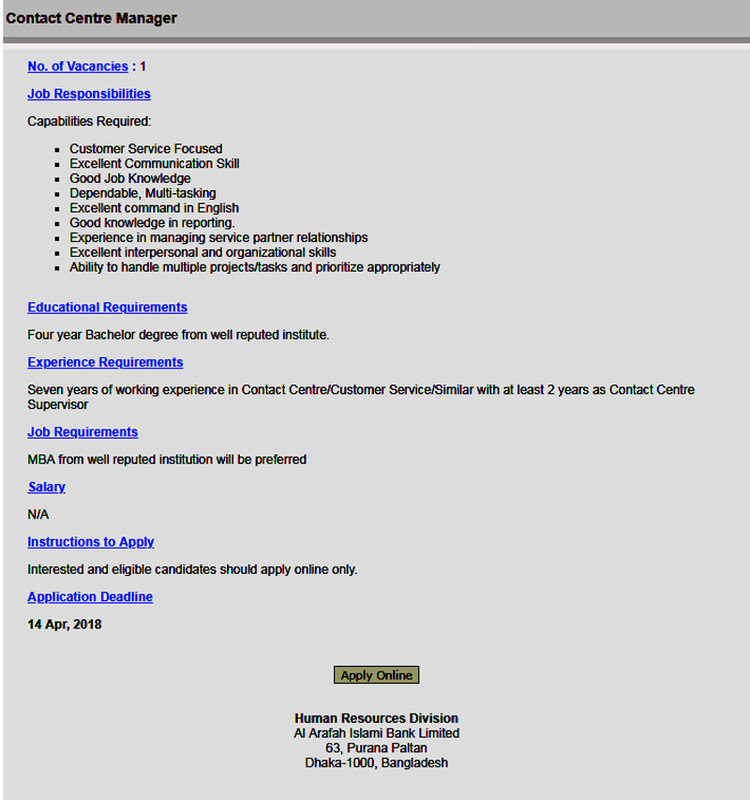 Interested and eligible Bangladeshi candidates are requested to apply online for the vacant positions. Deadline for submitting Online Application on See the Job Circular for details. Job Circular Published on Date: See the Job Circular for details. Online Application Starting from Date: See the Job Circular for details. 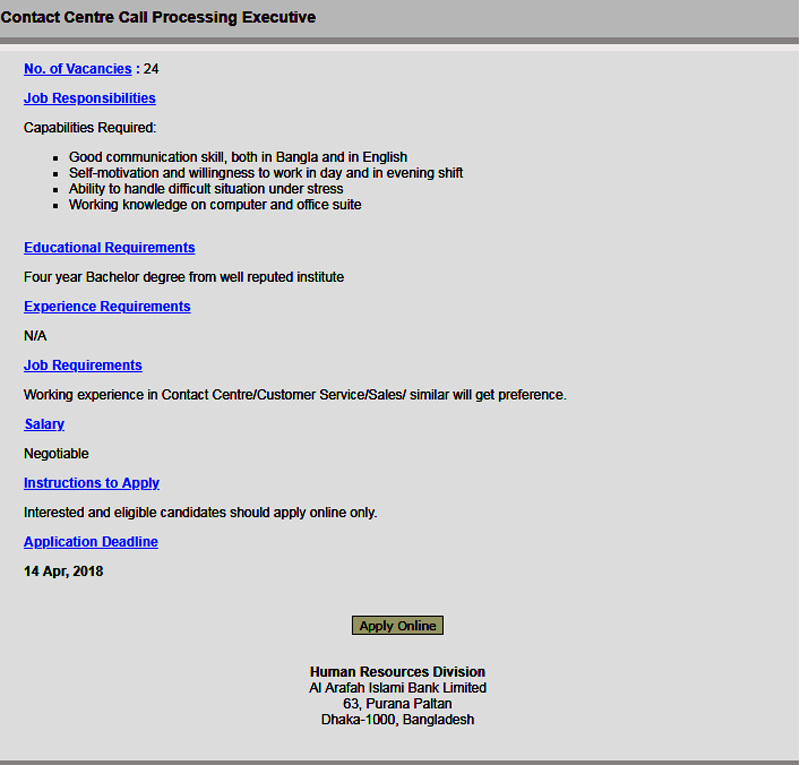 Online Application Ending Date: See the image Job Circular for details.